distribution Scattered over nearly all of the Coastal Plain, and sparingly into the extreme eastern Piedmont. Absent from the western half of the state, and possibly absent in northern coastal areas. abundance Generally uncommon (to locally fairly common) in the southern half of the Coastal Plain, and very rare and of spotty occurrence in the northern half. Rare to very uncommon in the narrow Piedmont portion of the range. Through 2016, the highest single-day count was only six individuals, but there have been several counts of double-digit individuals, including an excellent one-day tally of 50, in 2017.
flight The Coastal Plain flight occurs from early May to very early October, whereas that in the adjacent Piedmont is from mid-May to early August. habitat Generally in highly vegetated ponds or small lakes, especially with floating vegetation such as lily pads. comments The male has a red and black thorax, fairly similar to that of the Cherry Bluet. Through 2016 we had very few recent records, but a stronger interest in studying odonates, especially damselflies, has taken place in at least the southern Coastal Plain starting in 2017. 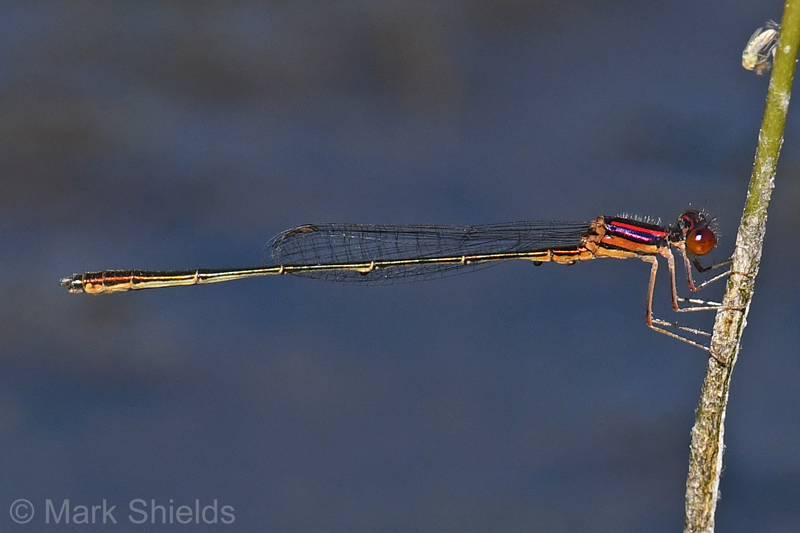 However, few people are searching for damselflies currently in the northern Coastal Plain, though it seems likely that the species has always been relatively rare in this part of the range.